Lenders have a pivotal role to play in keeping the buy-to-let market moving at a steady pace. Latterly, the regulatory and tax changes have caused a slowdown in the sector. So are lenders doing all they can to help shift the buy-to-let market up a gear and prevent it from stalling further? In a testing market, lenders have had to work hard to win market share. Connect for Intermediaries chief executive officer Liz Syms says this competition has driven rates down and innovation up. “Lenders have coped well with all the rule changes the regulators have thrown at the market,” she says. The Buy to Let Business and Buy to Let Club managing director Ying Tan also feels lenders have responded well to the changing market. “The influx of limited company buy-to-let products is a case in point, with the lending community taking action to help landlords manage the impact of Section 24. Lenders have also been offering some very competitive rates in order to help cushion the blow,” he says. So, what else can lenders do to ensure buy-to-let remains an attractive investment? The current nature of the market means some landlords are still uncertain as to their preferred route going forward and as such brokers would welcome increased flexibility from lenders. Alexander Hall director of lender relationships and new homes Greg Cunnington says its advisers and clients would like to see a lender offer a three-year fixed rate with a two-year tie-in that allows for consumer buy-to-let. If a borrower buys a new home before selling their previous residence they must pay the 3 per cent higher Stamp Duty rate for second homes, which was introduced in April 2016. If, however, they then sell or give away their previous main home within three years they can apply for the higher rate to be refunded. Cunnington says clients currently have the option of taking out a two or three-year fixed rate. With a two-year fixed rate, when the deal expires there are very few options that have no early repayment charges; so, clients either need to sell a year early before the Stamp Duty deadline or revert to the lender’s variable rate. Conversely a three-year fixed rate would end slightly after the three year Stamp Duty period and therefore if a product were offered with no ERCs after two years the final year of the fixed term would provide the client with a useful decision window – to sell or remortgage. Syms would also like lenders to reconsider some of their ERCs. “It would be better if lenders could either make these charges more moderate at the end of a five-year fixed rate, or enable a borrower to switch to a limited company mortgage with the same lender, two or three years in, without paying charges. This would then provide borrowers with more flexibility to switch and add to their portfolio over time,” she says. Lenders’ tenancy stipulations are another area where brokers feel there is room for manoeuvre. Some lenders are reluctant to offer long-term tenancies due to difficulties in being able to evict tenants if the landlord falls into mortgage arrears. “Longer-term tenancies such as two or three years offer both landlords and tenants greater security, as well as the lender, as it lowers the possibility of void periods,” says Cunnington. He adds: “Similarly a criteria working off an existing AST rental income figure, instead of a valuation figure amongst more lenders would be greatly received by landlords. Syms would like to see some lenders change their stance around holiday lets. She says for example, on AST requirements a lender may only lend based on a £1000 per month income, where the annual profit is more like £18,000 a year, which is 50% more. Top slicing, which is when a lender uses a borrower’s personal income to top up any shortfall in rent, is becoming more prevalent in the BTL sector but brokers would like to see it more widespread. Tan says it has been good to see the likes of Kensington and Virgin Money now allowing landlords to supplement any rent shortfalls with their own income. Looking ahead, Murphy feels the nature of rental properties is changing and lenders will need to adapt to this. “We’ve seen an increase in the number of properties being listed by landlords on Airbnb and there could be a much greater appetite to lend and offer products, to this type of landlord,” he says. He also believes a growing number of landlords are looking to purchase stock in a poor condition in order to renovate it to a much higher spec, which can then be let out at a higher price and simultaneously generate capital value. 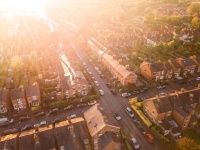 “In that respect, we sense there is a market for a greater degree of lender flexibility for landlords purchasing properties in poor condition in order to help develop the UK’s housing stock and to get it back into use,” he says. Syms would like to see more buy-to-let products for foreign nationals and those looking to purchase semi-commercial properties. While Mortgages for Business managing director Steve Olejnik would like to see lenders offer an offset buy-to-let mortgage. “This would be of real interest to landlords with cash balances and would potentially mitigate some of the recent tax changes for landlords,” he says. While Tan feels longer-term fixed rates may help those looking to fix their rate in light of the latest interest rate rise. “ I doubt we’ll see any further increases in the near future, however, it’s safe to say landlords and investors have seen enough evidence in recent years of how quickly things can change so it’s not surprising they’ll be looking for security,” he says. “It would be good to see more competitive longer-term fixes come to market,” he adds. In terms of pricing, Olejnik, predicts the recent Bank of England interest rate rise may cause some lenders to begin adjusting their pricing upwards. If Olejnik’s prediction is right and pricing does rise, lenders will have to look to other aspects of their proposition to maintain their appeal which could lead to increased innovation in the sector as more lenders are forced to think outside of the box.